Time for fun in the sun! Summer is a great time to take advantage of the longer days and get some more playtime with your furry, feathered, and four-legged buddies. Whether you're running on the beach, taking a road trip, or enjoying the fireworks show at the family holiday bash, it's always a good idea to keep your pet's safety and comfort in mind. 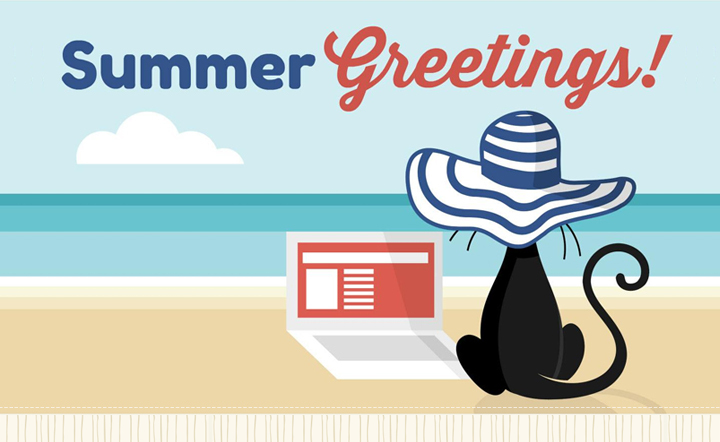 This newsletter brings you some good tips for a safe and happy summer, and we're always ready to answer your questions or concerns also, so don't hesitate to call us! We hope you and your best pet friends make some good memories this summer! Every summer veterinarians and shelters brace themselves for the influx of injured and/or lost pets, thanks to fireworks. Many pets find the noise, lights, and vibrations caused by fireworks to be absolutely terrifying, so much so that their only thought is to RUN - even if that means away from the safety of their homes. Ah, summer! So fun, yet also so filled with opportunities for itchiness and hot spots. 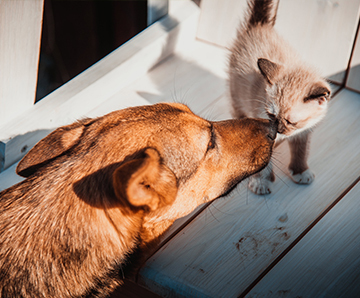 Moist air, bug bites, and allergens are just a few things that can inspire a pet to scratch him or herself raw. Anything that creates irritation to the skin, causing the pet to chew or scratch at the site, can cause a very uncomfortable hot spot. One of the best things you can do for your pet's well-being can be summed up in one word: PLAY. Playing with your pet provides physical exercise and mental stimulation, reinforces their natural social desires, builds a stronger bond between the two of you, and is just plain fun. No fancy toys needed, just you! Chances are, if you're hitting the road without your pets this summer, you've made plans for their care while you're away. You've crossed your t's and dotted your i's and made note of special treats and toys and schedules and such. But have you considered designating someone as your pet's health care advocate and decision-maker if communications fail and you're unreachable? Air travel and pets have always had a somewhat uneasy relationship, but recently we've been plagued with tragic stories of pets dying due to air travel, whether while flying or during handling between flights. Some airlines are changing their rules and handling methods as a result. If you plan to travel by air with your pet, plan and do your research well ahead of time to help make it a safe journey, and be aware of special dangers and considerations for certain breeds. July 15 is National Pet Fire Safety Day. Nobody enjoys considering potential disasters, but it's worth a few extra moments to make sure your pets are protected in the event of a fire, and also whether your home is pet-fire-proofed. That's right, pets can unwittingly cause fires with their curious natures, jumping antics, counter-surfing, and enthusiastic tails. Thank you for trusting Brooklyn Veterinary Hospital with the care of your pet's health. This electronic communication is being sent to you by VINx on behalf of Brooklyn Veterinary Hospital - 150 Hartford Road, Brooklyn, CT 06234 USA.